This week we have a review & giveaway of The Art of Vanishing by Cynthia Kuhn, along with a fun interview with Cynthia. Details at the end of this post on how to enter to win a copy of the book. We also have a link to order it from Amazon, and from an indie bookstore where a portion goes to help support KRL. Stone Dale University is hosting their annual “Twenty-first Century Arts and Culture Series,” which entails conducting workshops and bringing in prestigious speakers for Arts Week. American Literature professor Lila Maclean has been ordered by her chancellor to interview the famous author Damon Von Tussel, who decades ago wrote one much-lauded novel in his twenties and only now has released a new collection of prose. Damon has become as infamous for his tantrums and neglect of teaching duties as for his writing, so his disappearance from a planned event doesn’t come as a surprise. It shouldn’t have been unexpected either that it is Lila who is charged with seeing that Damon fulfills his obligations, considering that her mother, the artist known as Violet O, once had a torrid affair with the writer. While being Damon’s babysitter is an assignment Lila would prefer to shove off on someone… anyone else, she is still struggling towards earning tenure and at the mercy of her dean and chancellor. Damon’s behavior, which has him often disappearing or just drinking himself into a stupor, does nothing to make him more appealing to Lila. Others definitely disagree, from Damon’s until recently unknown daughter to the professor who is president of the Von Tussel Society and writing an entire book about him. When it seems that someone is intent that Damon Von Tussel never makes his presentation, Lila finds herself once again in the midst academic and scholarly chaos. 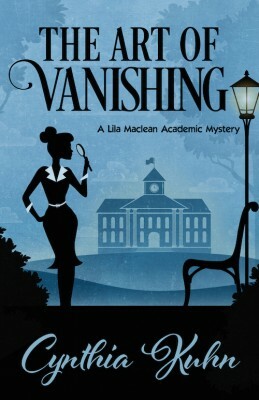 This Lila Maclean Academic Mystery series excels at exploiting the egos and infighting that seems to run rampant throughout the academia. The road to publication is seen as being the chief goal for many professors, with actual teaching being secondary. What the author so skillfully achieves is highlighting how what seems inane to many, for others becomes absolutely vital and worth killing over. Lila’s relationships with her fellow professor cousin and a best friend who may be becoming more, lend humor and much-needed normalcy to her life. It is the competition within her own department that escalates the suspense and makes everything very personal. This is another highly entertaining novel that revolves around the prickly egos and insecurity of highly educated characters who seem to live outside of the mundane world. Cynthia: I don’t ever remember not writing. My first publication, a poem, didn’t happen until the 1990s, though. KRL: When did your first novel come out? What was it called and can you tell us a little about it? Cynthia: The Semester of Our Discontent was published in 2016 as the first in the Lila Maclean Academic Mystery series. In it, you will meet Lila and the rest of the faculty as they confront their first mystery (which, unfortunately, doesn’t end well for a few of them). Cynthia: I began writing mysteries in 2011 but before that: fiction, poetry, essays, and literary criticism. Cynthia: The fictional Stonedale University is a small, private school–not Ivy League but prestigious nonetheless–in Colorado. 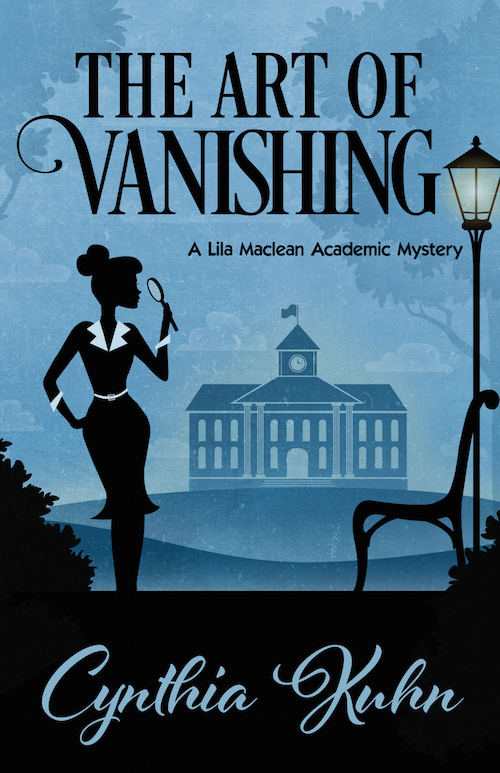 Lila Maclean is a new professor, and The Art of Vanishing takes place during her second semester. She isn’t sure she fits in there, though, as she has a rather different background than most of the people there. From the beginning, I had a clear sense of setting and the main character (the rest took much longer to work out). Cynthia: If readers are engaged by the issues explored within the books, that’s great, but first and foremost, I hope they enjoy the reading experience! Cynthia: Since I’m a parent and a teacher, it has to be whenever I can! Cynthia: I begin with a bullet outline of events (one per chapter) that serves as a sort of backbone, but the story typically takes on its own energy and goes elsewhere during the writing. After I have a complete first draft, I type up a detailed timeline, which is updated with subsequent drafts during the long revision process. Cynthia: First thing! Would love to be able to wake up and immediately write for hours and hours. Cynthia: An editor said something along the lines of, “I can’t tell you why I like this poem over the other one, but I do, and I’d like to publish it.” Appreciated the honesty of that. Also, when you’ve been submitting work for a long time and have racked up your share of rejections, an acknowledgment of subjectivity is heartening. Cynthia: Once when I was signing a book, the person kept adding people to the inscription. They didn’t indicate upfront that there would be ten names but just continued saying and slowly spelling names as I wrote. I had to write smaller and smaller to fit them all onto the page. It felt like a comedy sketch after awhile. Cynthia: The immediate goal is to complete book three in the series (more mayhem at Stonedale)! Cynthia: Margaret Atwood, Sylvia Plath, Alice Walker, Amanda Cross (Carolyn G. Heilbrun), L.M. Montgomery, William Goldman, J.K. Rowling. Cynthia: For the scholarly books, it’s intense, sustained research related to text, criticism, and theory. For the mysteries, it’s whatever pops up as I’m writing. For example, with The Semester of Our Discontent, I researched secret societies; with The Art of Vanishing, I read about priceless manuscripts. Cynthia: Mysteries! I’m always reading one. Also, there’s a steady stream of literary texts for work (I teach college English). Cynthia: Right now: Sherlock, Orphan Black, and Feud: Bette and Joan. Cynthia: Read widely, connect with other writers, and never give up. Cynthia: If you know where to look, I’m visible in the 1988 movie Kansas for three whole seconds, as part of a crowd! To enter to win a copy of The Art of Vanishing, simply email KRL at krlcontests@gmail[dot]com by replacing the [dot] with a period, and with the subject line “vanishing,” or comment on this article. A winner will be chosen April 15, 2017. US residents only. If entering via email please include your mailing address, and if via comment please include your email address. This sounds like a terrific story. Thanks for the opportunity. Thanks so much for hosting and reviewing! Thanks for the chance to win a copy of this book. Sounds like a great story. Thanks for the review and interview. Would love to win a copy and have now added the series to my TBR. Thanks for this chance to win and read! I really like Sherlock too. “The Art of Vanishing” sounds like an intriguing read. Would like to see what happened to the people who vanished. Great ‘new to me’ author- Thanks! Sounds great! Thankyou for the opportunity!